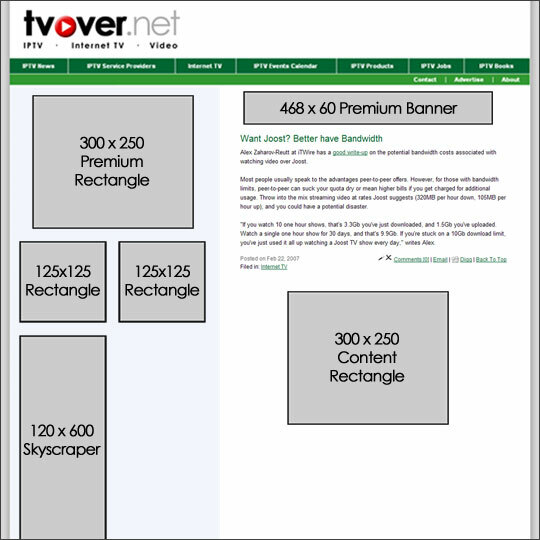 TVover.net has developed into a leading site that aggregates news and information about IPTV and Internet TV. The site provides up-to-date information gathered and provided from various sources and organizes the content into categories, such as reports, events, regulation, service providers, set-top boxes, provider hardware and software to name a few. Additionally, we provide one of the most detailed directories of sites broadcasting Internet TV on the web. The directory is updated with new stations on a weekly basis and all stations are organized into various categories, countries, and languages. Those two features coupled together provide an advertising environment that reaches a rapidly growing web site audience and RSS readership which consists of both consumers and industry professionals. Download the TVover.net media kit. TVover.net provides several opportunities for advertising on our web site.